Born: Abt. 1809 in Carver Ma. Died: November 16, 1875 in Oregon at 66 yrs. Married: August 20, 1834 in Sandwich Ma. 1. Susan Harlow Westgate Barlow; (October 7, 1838 – September 29, 1924); Married Jesse Bartlett Barlow, Capt. (1838 – 1902) (Jesse Barlow, Jr., Capt. & Maria Swift (Ellis)) in Sandwich Ma. on September 30, 1857; Susan & Jesse & their daughter Innazetta F. Barlow are buried together in Pocasset Cemetery. 2. Mary F. Westgate Kendrick; (1839 – February 18, 1914); Married Warren Kendrick, Jr. (1837 – 1925) (Warren Kendrick & Bethia Phillips) in Sandwich Ma. on November 29, 1863; Mary & Warren, Jr. are buried in Pocasset Cemetery. 4. 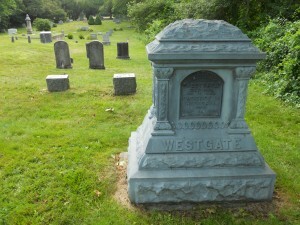 Charles F. Westgate; (1846 – August 25, 1846); Charles died at 6 mos, 4d..
5. Lucy Franklin Westgate; (January 11, 1848 – April 28, 1850); Lucy died at 2 yrs, 3 mos..